MEYER -Neueste Karte von Georgia mit seinen. . . 1845. N° 79. MEYER, J. - Neueste Karte von Georgia mit seinen. . . 1845. N° 79. Neueste Karte von Georgia mit seinen. . . 1845. N° 79. - MEYER, J. Title : Neueste Karte von Georgia mit seinen. . . 1845. N° 79..
Map maker : MEYER, J.. Date : Hildburghausen / Philadelphia, 1846. Size : 14.6 x 11.8 inches. / 37.0 x 30.0 cm. 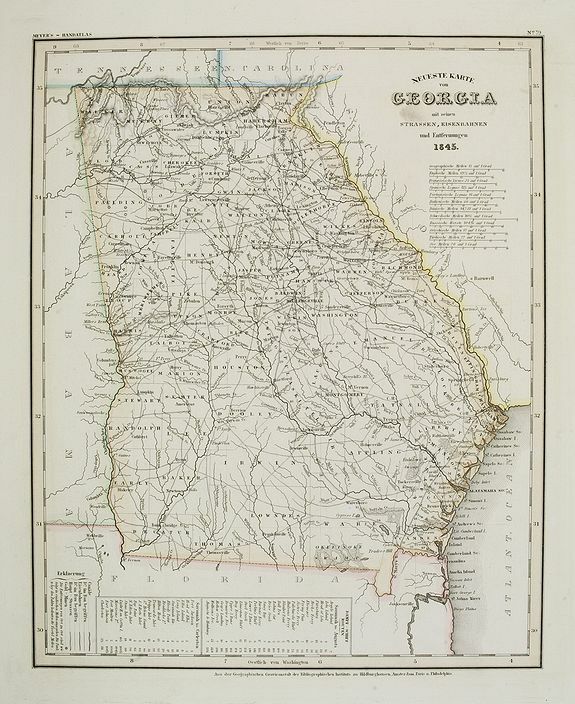 Description :Detailed map of Georgia with numerous physical and political features including mines, settlements, trails/roads, forts and Indian areas. From J. Meijer's Grossem Handatlas published in by the Bibliographisches Institute, Hildburghausen, Amsterdam, Paris and Philadelphia. Condition : A good impression. Some very minor browning, mainly in the margins.